Plague is a disease is caused by a bacterium usually found in small animals and their fleas. Untreated, 30%-60% of people who become infected die; it has been responsible for several pandemics throughout history, of which the Black Death in the 14th century was one. Bubonic plague, where the lymph nodes become swollen (forming 'buboes') is the most common form. The Black Death spread throughout Europe between circa 1346-53. The average number of vicars 'instituted' in the Exeter diocese because of death or resignation was usually 36 a year - in April 1349 alone there were 53. John de Undele had been vicar of Ashburton since 1335, but he was succeeded in 1348 by David Penylis, who died just before Christmas. Richard Yurl was instituted on January 1st, but Thomas de Botercombe was instituted only ten days later. 'The lands with which this chapel [St Lawrence] were endowed were valued in the reign of Edward VI at 10l 15s 8d per annum. The overplus was appropriated to the maintenance and reparation of leaden pipes "for the conduction of holsome water for the relief of the infected when the plague should be at Ashburton, that they might not infect others." 'The family of Fabyan was one of some position in Ashburton, and was resident there for a considerable period. In 1625* Ashburton was visited with an outbreak of plague, and the registers record the deaths of no less than seven members of this family in four months. During Charles I's reign (1625 -1649) 'the plague appears to have pressed very heavily upon the county at frequent intervals.........The regular course seems to have been to shut up in their own houses persons who were either infected, or had been in the company of infected people, and thus to try and isolate the disease. As such persons could not follow their usual avocations, some small weekly pittance was allowed for their support, and a rate for this purpose was levied upon the adjoining hundred.........Totnes, Ashburton, Buckland and North Bovey had £150 between them'. 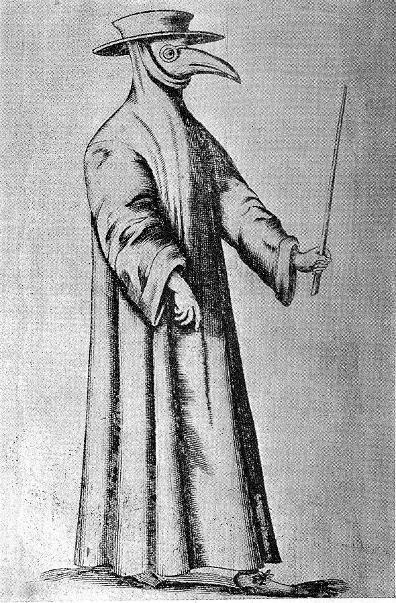 Above: 17th century plague doctor. Image no L0025221 from the Wellcome Library, London. Many thanks to the Wellcome Library, London, which kindly allows images from its Digital Gallery to be used under this Creative Commons License for educational and non-commercial purposes. The parish records show the number of burials per day building up through March and April 1626 - sometimes five or six a day. Something was certainly going on in Ashburton in 1643. 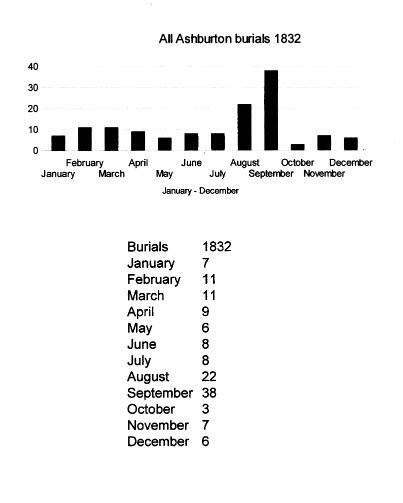 In May of that year there were 10 burials in the parish; in June only 5. Six people were buried in July, but fourteen in August. There were 40 burials in September, and 35 in October - seven of these were on one day. 17 people were buried in November, and by December numbers were back to a more normal 7. Large numbers of the dead were children or young people - the parish register entries note 'filius' or 'filia' ('son of' and 'daughter of'). 1643 was near the beginning of the Civil War (1642 - 1651), and according to the British Civil Wars project, by May 1643 most of the West Country was in Royalist hands. Bristol was captured at the end of July, and Exeter and Dartmouth followed, but Prince Maurice failed to secure Plymouth at the end of the year. So there were troop movements and fighting in the south west throughout the year. Civilian towns and villages would have been expected to supply men to join both armies, and to give food and accommodation to soldiers who were already weakened by the rigours of a cramped and unhygienic camp life. Any disease that these men brought with them was introduced into communities stressed by the war and its demands. 'Camp fever' is synonymous with typhus. It was in Oxford in 1643, where Edward Greaves wrote a pamphlet, Morbus Epidemius Anni 1643 on 'the new disease most contagious'. There was an outbreak in Tiverton in 1644. There was an influenza outbreak in England in 1775. Dr Thomas Glass, of Exeter, wrote: '...from the 8th of November the number of people [in Exeter] who were continually coughing increased so fast that it was soon evident the epidemical colds, which began in London, as we were informed by the public papers, more than a week before, had reached us....On the 11th or 12th of November it made its appearance in the Devon and Exeter Hospital, and within a week seized 173 persons, being all the servants and patients then in the house, except two children; 162 of them were coughing together...two or three days after the hospital had been attacked, the city workhouse was visited by them; of near 200 poor people, who are in this house, but few escaped; all the others were complaining at the same time. Cholera, a water-borne disease, did not appear in England until 1831, but worldwide there were 8 pandemics between 1817 and 1902. John Snow, a major force in identifying the cause and spread of the disease, reported on 'the mixture of cholera evacuations with the water used for drinking and culinary purposes, either by permeating the ground and getting into wells,or by running along channels and sewers into the rivers from which entire towns are sometimes supplied with water'. Credit: Wellcome Library, London. Many thanks to the Wellcome Library, London, which kindly allows images from its Digital Gallery to be used under this Creative Commons License for educational and non-commercial purposes. Ashburton, September 1st 1832 John Elliott, a baker aged 67, died of cholera. In 1832 46 persons were 'taken off' in the space of a month: this was followed by Board of Health regulations, apparently effectively enforced. 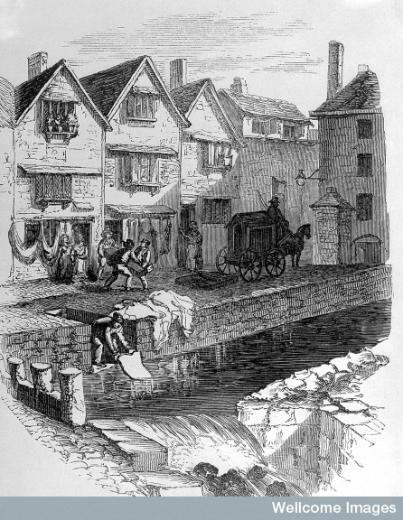 At a public meeting in Exeter in 1846, the subject of water and sewerage was on the agenda. The question of what to do with sewerage after it had passed through any pipes seemed to have been solved by places as diverse as Edinburgh, Crediton and Ashburton, where waste was distributed over a large section of land, and made valuable manure. In 1849 it was reported that Ashburton, with a population of 4000, was still free from the cholera, 'through the goodness of the Almighty'. However in 1854 Mr. Hele, the medical officer, reported to the Board of Guardians that many people in Ashburton had diarrhoea. As there was cholera in London he suggested that the Board looked at the cleanliness in tenements and back premises, where there was poor drainage and little water. A month later a correspondent to the same newspaper claimed that it was a 'monstrous absurdity' that sewers were being cut in the town, without sufficient water to flush them through, especially as cholera was advancing through the country. In 1866 a travelling woman attending Ashburton fair was diagnosed with cholera by Dr MacGill. December 1867 The Exeter and Plymouth Gazette reported that smallpox was still active in Ashburton, but patients were recovering. In 1843 a Mr Coles, 'Surgeon-dentist' based at Plymouth, could be consulted at Ashburton on the first Tuesday of every month from 11 until 4. By 1870 Mr D M Ching, also a surgeon dentist, was offering a similar service. Also based at Plymouth, he could be consulted on the third Saturday in each month, at Mr Giles, East Street. Artificial teeth cost from 5s each - a complete set was £3 3s. 1863. George Yolland, the only son of George Wills Yolland, died from lockjaw after an accident on his uncle's farm. He had accompanied his uncle, James Hext, of Hallsworthy Farm, Staverton, whilst hedge trimming - he got too close to the hook and one finger was severed, and others lacerated. Dr W S Gervis attended to him at Ashburton, but some time later the child developed the symptoms of tetanus. He died the following day. Dr Armstrong, the Medical Officer for the Newton Rural Sanitary Authority, gave his quarterly report at the October meeting in 1875. Mortality had increased in Ashburton, but that was due solely to an outbreak of scarlet fever, which had probably spread from Buckfastleigh. It arrived in a mild form in September, but there were 9 deaths before the end of the month - recently there had been two more. Hand-bills had been distributed to all public schools in the district, warning parents of this highly contagious disease. In 1877 Charles Joint, aged 16, died of hydrophobia. He had been bitten on the hand by a dog, but experienced no symptoms at first. Then his hand and arm became numb, and soon he was in 'paroxysms of pain' before his death. It was the second case in the county. 1898. Kate Bowers, aged 40, was a cook for Miss F Tozer at Priestaford House. In December 1898 she took a message to William Henry Morish, the coachman, who noticed that she had mud on her dress; she said that she had fallen coming up the steps to the yard, and had knocked her head. Returning to the house she told fellow servant Annie Murch that she had had a bad fall, and she went to lie down on her bed. Annie said that Kate was giddy and sick when she checked on her, and two and a half hours after the accident she found her on the floor unconscious. Miss Tozer was no longer at home, so the servant called for help, and Dr Wilcox arrived in half an hour. Kate died about 10 minutes later, and in the doctor's opinion death was caused by the blow on the head compressing the brain. Mary Jane Salter, wife of Francis, died in August 1903, aged 66. She had been district nurse for 11 years. The dogs' trough in the Bullring was causing concern in 1941, because children were getting onto their hands and knees and drinking from it. The Medical Officer, Dr R G Hall, said that there were 'grave objections' to using a metal cup, and the Public Health Committee was asked to consider providing drinking water via a jet. In the early 1800s a James Morison, 'Hygiest', created a vegetable universal pill to cure all ills: consumption, nervous complaints, ossification of the heart, hooping cough, vomiting etc. etc. The 'British College of Health' which features in the title of his book was Morison's own creation: 'One of the cleverest things he ever did' according to John Malcolm Bulloch. Mr John Lopus was the Ashburton agent. In Victorian times if you were ill and wealthy you paid for a doctor to see you in your own home. 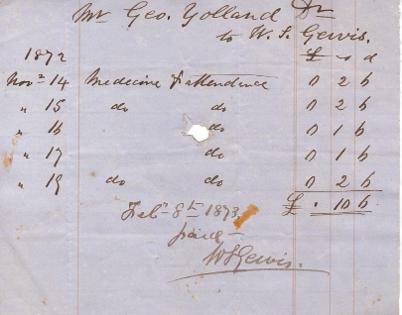 If you were ill and poor you treated yourself - or attended a charitable hospital or a workhouse infirmary if you were seriously ill.
Below and below right: doctors' invoices for 'attendance and medicine' for Mr George Yolland and Mrs Yolland. 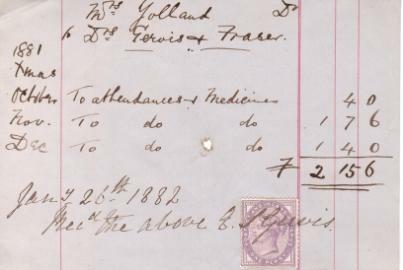 In 1872 the doctor is W S Gervis; in 1881 the doctors are Gervis and Fraser. In August 1875 a meeting in the Town Hall recognized that the better off in the community 'were all bound to do what good they could to their poorer neighbours', and resolved to build a Cottage Hospital in the town. By February 1876 a hospital was opened at Greenaway Lodge in Church Lane, near the Railway Station. 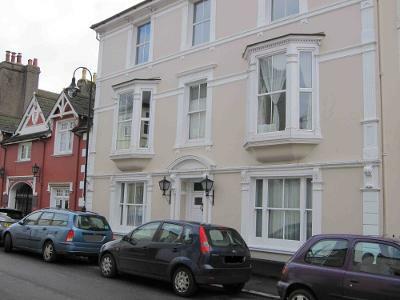 Owned by Mr Mann jnr., the house was turned into a hospital with two beds in a ward on the first floor for male patients, with a similar ward for female patients above that. 'Each ward is very neatly and comfortably furnished' - and that included counterpanes on the beds with passages of scripture worked on them. Right: Greenaway Lodge - the original hospital. The 1881 census shows Henry Ubsdell, a 42 year old General Practitioner, living in Market Street, Buckfastleigh. Unmarried, he was born in Middlesex. As to the nurses required, several local advertisements at this time seek 'a middle aged woman' for the post. (Mrs Christian Daw in another entry on the same page). In 1880 a new entrance to the hospital from the Station was made, giving patients a better view, and also allowing passengers on the train to see the hospital - presumably beneficial for fund-raising. It also allowed vehicles to stop near the door. The 1881 census shows Clara Walters as the hospital nurse and matron at the Church Lane premises (https://familysearch.org/), assisted by a servant, Mary Bickford. In 1886 the hospital committee decided to erect a new hospital - it seemed a fitting commemoration of Queen Victoria's forthcoming (golden) jubilee. Mr R G Abraham offered to give half an acre of land near Leny Water in Eastern Road for the purpose, and by February 1887 over £1043 had been raised towards the building costs. Thomas Smerdon, an 'elderly labourer', employed at Horsehill Farm. One rib and shoulder bone broken, plus a scalp wound, after being dragged by a horse. John Michelmore of Brixham, employed at the paint works near Gulwell Bridge. In 1901 two sons of R B Joint, mason, died in the Cottage Hospital. They had contracted scarlet fever 5 weeks earlier, but had appeared to recover. Dr Rawson attended them both when they became ill again, and had them moved to the hospital, where they died the same day. They were aged 8 and 9. A son of Mr W. Yeo of the Engineer Arms Inn. Following boys on the Terrace Walk, hit in the back with a large stone which rendered him senseless. Attended to at the hospital by Dr Fitzpatrick. William Furze, employed by Mr J Smerdon at Gaye's Farm. Severely cut his arm whilst pruning a hedge. Henry F Prout, employed by Mr G Allen of Wickeridge House, Woodland. Seriously injured his back when a barrel of oil fell on him at the goods shed of the Railway Station. Peter Foot of Widecombe in the Moor. Thrown from a horse at Great Bridge. In a critical condition at the time of the newspaper report. George Henry Hamlyn, son of William Henry Hamlyn, of Hannaford's Court, Ashburton. Hit by a motor car and taken to the Cottage Hospital, but he was dead on arrival. In 1901 30 year old Wilson Ranson was living in East Street. Born in Norwich(? ), Norfolk the entry appears to read 'surgeon'. 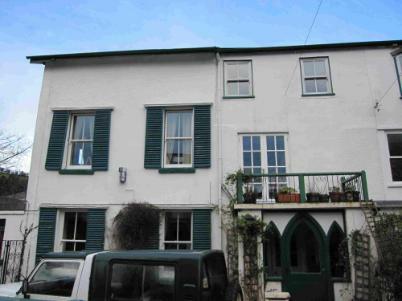 In 1901 38 year old John W. Wyncoll was living in Plymouth Road, Buckfastleigh. Born in Halifax, Yorkshire, he was a physician and surgeon. In 1901 44 year old Ernest Wilcox was living in West Street, near to Sparnham. Born in St. Neots, Huntingdonshire, he was a surgeon and general practitioner. In 1901 Mary G. S.James is shown at the Cottage Hospital, a 29 year old matron. She was born in Egg Buckland, Devon. In 1917 The British Journal of Nursing reported that Miss Amy F M Horne had been appointed as Matron. She had held posts in Kent, but had also been sister at Brixham hospital and matron of Bovey Tracey and District Hospital. Miss Mary Maria Oliver died at her house in West Street in 1925, aged 82. 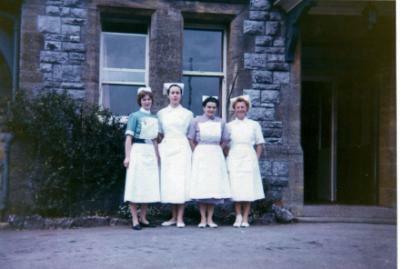 A nurse trained at the Nightingale Home, St Thomas, London, she had been matron of the Ashburton and Buckfastleigh Cottage Hospital for 5 years. In the early 1940s the dustbin lorry doubled as an ambulance - a section could be removed and another section inserted. When Jack Bligh, the manager of the quarry, was hit on the head by a stone, he was transported to the Cottage Hospital in this vehicle. Remembered by Wendy Major, Jack's daughter. In 1947 the Secretary's report stated that the trustees had purchased a quarter of an acre of land to the west of the hospital. The plan was to have enough space to build a nurses' home: 'It was felt that if there were not space for a suitable building when the Government took over it might endanger the future of the hospital'. One story that Ellen told was of an elderly male who died. His grieving widow insisted on retrieving his false teeth, explaining 'We share them'. '(In the 1920s) there were two doctors in the town, one at the top of East Street, and the other better known in West Street, opposite the parish church. Dr Ellis, who was our doctor, was a tall, thin, austere looking man who presided in the surgery in West Street. I learnt from him at a very early age not to judge by appearances. I was taken to visit him one evening by my mother for some minor complaint. We entered by the double doors and walked over the paved courtyard to the entrance. Emerging was a young woman with a baby in a pram and two young children holding her skirts. When we saw the doctor my mother asked him how such an overburdened patient would be able to pay him. "Florence", said Dr. Ellis, "come to my desk". One ledger was open and he showed her a list of names to which he added ours. "You and all the patients here will be receiving a bill from me which you will pay promptly." Bringing over another tome he said, "the patient who has just gone out will find her name here. Those people will not be receiving an account. In the fullness of time, God will repay me." A salutary lesson for a small girl to learn, but one I have never forgotten. After this encounter I watched Dr. Ellis with his elegant wife and young son at church each Sunday and felt that he must have had some special relationship with God. I even wondered if some sign would appear to acknowledge his goodness. As well as the childhood infections of measles, mumps, whooping cough and scarlet fever, impetigo and scabies was common. Ear infections were often treated at home with old wives' remedies, and warts were charmed away. In this period, a group of well meaning men, including my father, founded “The Hospital Scheme”. On a Friday night (the men would have been paid that day) they would go out with a notebook and a drawstring bag to collect the dues. One penny per week for a single person, two pence for a married couple and three pence for a family, irrespective of the number of children. When accidents or illness befell and the doctor pronounced “Hospital” the scheme would pay the bill – twenty five shillings a week whether it was the local hospital or the new one at Torquay, so far away. Patients who were unfortunate enough to be suffering from tuberculosis would be sent to Hawkmoor between Bovey Tracy and Morton Hampstead. Patients were conveyed to the local hospital in what I can only describe as an elongated perambulator. It had a brown canvas hood and cover and was pushed by two St John Ambulance men. It can still be seen in the St John Ambulance Hall today. A relative being sent to Hawkmoor caused great hardship to the family as it was a difficult journey to make to visit the patients. It meant getting a bus to Bovey Tracy and then another bus to take them on the final part of the journey. Fares were not often easy to find and the lonely waits for connections to and from the hospital made a sad journey almost unbearable. Few survived tuberculosis, caused by poor housing and bad nutrition. No doubt the victim, if the breadwinner, would worry about his wife and family and how they would survive without him, but as always neighbours and friends, poor as they were, helped those more unfortunate than themselves. Adults whispered the words “tuberculosis” or” cancer” knowing they meant a death sentence to the patient. People rallied to help each other when misfortune struck a family. Neighbours supported unfortunates who had fallen on bad times. Straw would be laid in the street outside the sick person’s home to deaden the sound of horses and carts passing up and down. Beef tea was made by those who could afford to spare meat. Shin of beef was cut up, placed in a stone jar and covered with water; the jar had a cloth tied firmly on the top. This was steeped for many hours on the top of a range. After a day and night the concoction was strained and the liquid was ready for the invalid to drink. Sadly, in most cases it proved ineffective. Many thanks to Hazel Bray for the above item. 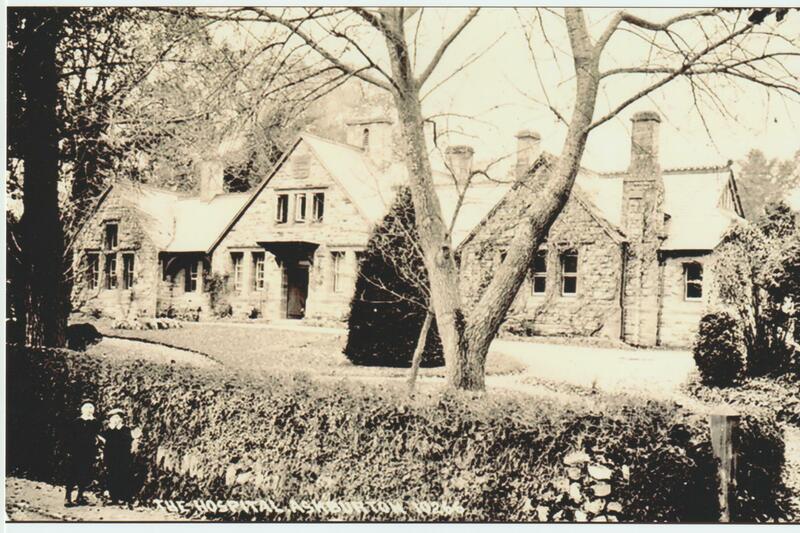 The Abbotsbury Nursing Home was located at 68 East Street, and operated between at least 1941 and 1949. It seems to have been primarily (if not solely) a Home for mothers to give birth in. The location has been identified by an Ashburton resident who was born there, and the date range comes from birth announcements in the local newspapers of the time. Told to lady who was born at the nursing home, presumably by her mother. William J Eales was living across the road in 1939, at no. 79. Although he described himself as a boarding house keeper, he was probably the same William J Eales who had been a butcher at no. 42 in the 1930s. See Butchers, under Banks and Businesses. In 1887 Swine fever was in Widecombe and one place in Ashburton. Pigs belonging to Mr William Daw, miller, died or were culled by order of the magistrates. He lost animals worth in total about £70.